Ideal starting point for a short break in the Salzburger Land. Countless destinations can be reached quickly - but you can also use the proximity of the city to enjoy - for example in summer - the great atmosphere of the Salzburg Festival. Travel time by car from Salzburg airport: 20 min. A bus takes about 3 minutes from the house in about 25 minutes directly to the city of Salzburg! Distance to the lakes: Wallersee: 15 min. / Fuschlsee: 25 min., Mondsee 20 min., Wolfgangsee: 37 min. Ideal for families who want to spend a cheap holiday in Salzburg with children. extensive hiking possibility directly from the house possible (meadows / forests) golf course in the immediate vicinity. New bike path to Salzburg. Ideal also for festival guests. Excellent for winter tourists - numerous ski areas can be reached in 45 minutes. Netflix and Amazon Prime available. Fantastic sunsets and maximum relaxation on the terrace! Magnificent picture windows in the living room. We enjoyed a wonderful stay at our host's home for a week this August. This is a peaceful, well-positioned house in a quiet residential neighbourhood, less than half an hour outside Salzburg. The detached property was well kept with a 'family-feel', clearly welcoming of young visitors and, if you were travelling with a baby, would be well-equipped too. Being slightly older, our children found the house comfortable with plenty of space for two kids to have their own bedroom if they choose, and access to films, and the internet. There is so much to do in the region, however we were barely in the house except for evening meals. Within a few minutes of the house there are two eateries we dined at, reasonable prices with hearty local cuisine and beers to sample. Our host could not have been more helpful and his Welcome Pack information (sent helpfully in advance by email, as well as being available in the house on arrival) really helped us with planning excursions and accessing all amenities. Alexander went out of his way to ensure we had all we needed, including contacting us after arrival to make sure we had gained safe entry and that all was to our satisfaction. Should any issues arise during your stay (they didn't) our host puts at guests' disposal his family members who live nearby in the neighbourhood. We did not have any difficulties during our stay, but the family were still a helpful additional source of information about local routes and amenities. All of us enjoyed the mature, peaceful garden with its large eating area for meals. Local shops are accessible and with good range of prices. Safe, off street parking at the house is a plus point for those with a holiday hire car that needs extra care of those car rental excess premiums! Trips from the house to amuse all ages and interests are easy, on foot, by car and the bus to Salzburg is very close to the house (25 minutes). We took our host’s advice and visited Wolfgansee (Lakes), numerous cable cars (including panning for 'Gold' at a former mineral mine), ascending local viewpoints to striking panorama overlooking Austria's mountainous roof and used the house too, as a base for longer-distance days out. We travelled easily over the boarder to Salt Mines and historic Bercahsgarten and back, comfortably in a day. We heartily recommend Alexander as a host and his house. We had everything we could have wished for in this lovely property, ideally located to the proximity of Salzburg. There was plenty of space for our two children to run around and befriending the neighbours cat, Silva, was the highlight of their stay! The only thing we lacked was air conditioning but then the temperature for the time of year was unusually hot, so we worked around that. Would have no hesitation in recommending the property to any of our friends or family who are looking for an ideal base from which to explore Salzburg and the surrounding area. We enjoyed our stay in this charming home very much. The house was clean and comfy. There was plenty of room inside as well as a nice large fenced yard. The kitchen was well stocked and came in very handy. Alexander was extremely kind and helpful with places to visit and getting around. We made several day trips to Salzburg, and also visited Hallstatt, Bad Ischl and Wallersee. We also enjoyed daily morning walks in the neighborhood. Ideal for retreat, or a base for regional touring! We stayed for three weeks, July-August. It really is home away from home. We felt very welcome! The decor says 'home' not 'hotel', the kitchen has every sort of useful appliance and utensil in it, there is a compost tip, and the spacious house even has a new dishwasher, clotheswasher, and microwave. Plenty of towels and linens. Several places to sit and be comfortable. Great big windows enable effective summertime temperature regulation. A balcony wraps around part of the upper level. There is shade outdoors at every time of day. Occasional evening thunderstorms come with delightful anticipatory breezes. The owners are super friendly, and very attentive, with long roots in the area. They even gave us some homemade juice from their garden! The neighborhood is quiet, peaceful, and attractive. There is a nearby bus stop where you can get a bus to Salzburg, a ride that that takes 15 minutes thru rolling countryside areas. A well-stocked food store (Spar) is a 15-minute walk away. No Internet quotas, plenty of bandwidth. Lovely large yard, good for strolling. The veranda, the wooden floors, the garden will all remind you of your favorite relative's home. Great location for the Salzburg music festival, hiking, and lake swims. Ample parking at the house for your car. Ideal as a retreat, and as a base for regional touring. Strongly recommend! Very large, quiet and confortable house with a nice garden and a garage.. Very warm, friendly and helpful welcome. Salzburg city center as well as Mondsee lake can be reached within 15 minutes by car. Vacanze bellissime. Casa spaziosa, pulita e accogliente, completa di tutti i comfort, immersa in un bel giardino in una tranquilla zona residenziale. Proprietario molto gentile e disponibile. Noi ci siamo arrivati con la nostra auto e il centro di Salisburgo si raggiunge velocemente con una comoda tangenziale. Nelle vicinanze ci sono supermercati e negozi di tutti i tipi. La neve ha reso il paesaggio incantato. Ci ritorneremo sicuramente. Eugendorf is a large municipality near Salzburg. 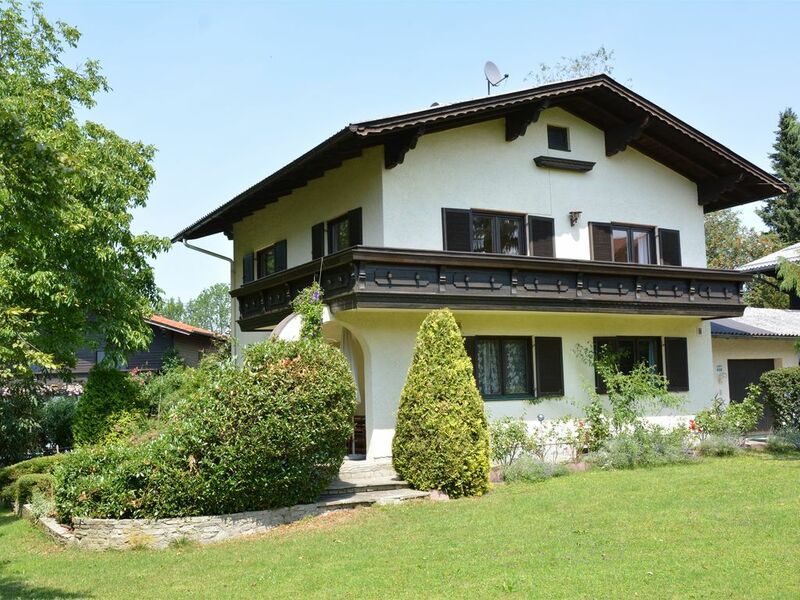 The location of the house is located about 1.5 kilometers from the small town of Eugendorf .. Salzburg City is on the main road in about 20-25 min. to reach. Directly in Eugendorf the junction is Wallersee (Westautobahn A1) - take the exit Salzburg Nord 10 minutes drive, take the exit Salzburg Mitte 15 min. Journey time. The object is a golf course in 5 min. Walking. Directly from the house expanded walks on groomed paths (meadows and forests) are located. Duch Continuous, new cycle path to the center of Salzburg. Extensive cycling opportunities. Inline skating.